© 1999 Andrew C. Stone and Stone Design Corp. All rights reserved. 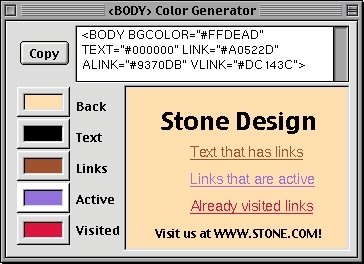 Web Colors©, by Stone Design, helps you select colors that look good in web pages on the vast majority of low grade color monitors in use around the world. 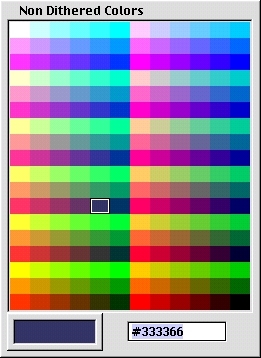 Since most color displays only support 256 colors, the colors in the panel on the right are guaranteed to be rendered in one solid color. There are millions of possible RGB color combinations, but these RGB triples will not be dithered, and thus will look better. A special <BODY> line generator helps you instantly mix and match colors and formulates the entire <BODY> tag line. Simply click on a color to see it's RGB representation, for example "#333366". 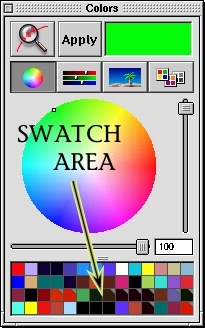 You can copy this text to paste into your HTML document, or you can drag the color from the Color Well and place it in your Color Panel Saved Swatch Area for use in other applications. 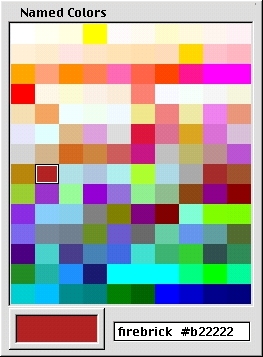 Web Colors also provides you with the Netscape Named Colors - simply click on a swatch to see it's name, as well as it's hexadecimal representation. You can use the names instead of the hexadecimal representation in your web pages (such as "firebrick"), since they convey more info to the avcerage user. However, these are not guaranteed to be non-dithered! For more information on Stone Design Corp and the latest versions of all of our apps, visit us at our web site, www.stone.com, or email us at info@stone.com. Our introductory price - no price at all! It's free!